Novato specializes in limited edition apparel and one-of-a-kind shoe, hat, and print designs. Based in Bellingham, WA. 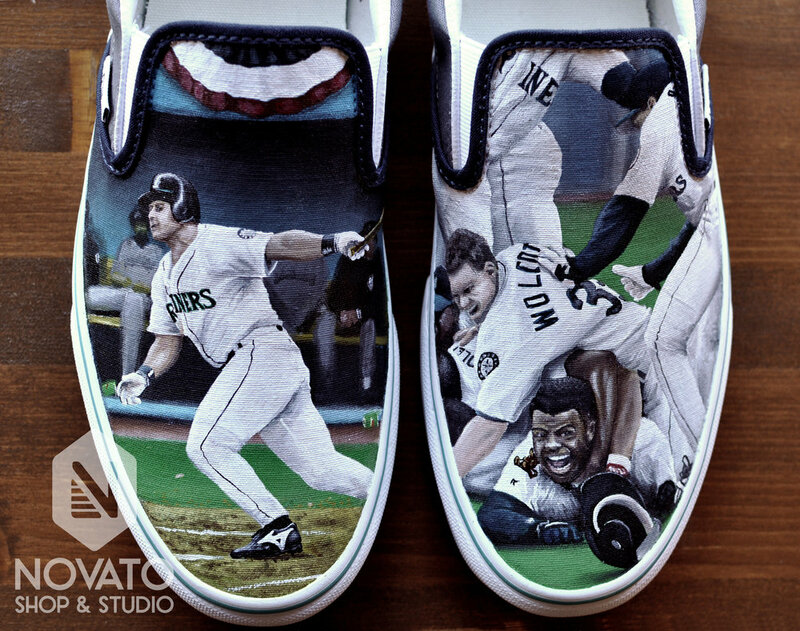 We’ve been hand-painting custom pieces of art for your feet since Novato’s beginning. Whether you work closely with us to design the perfect pair or give us a theme and size and to surprise you with, we can create a truly one-of-a-kind piece of wearable art that is yours and only yours. Find CUSTOM SHOES DEPOSIT in the "Apparel" store. A $50 deposit gets you in the queue. At this point we’ll contact you and start talking some details, like brand, style, size, and design. When your spot comes up, another $50 installment gets us started on your shoes. We work with you to finalize all the details including pricing before we get started. Upon completion, you see your new shoes before you pay the remaining balance. Then you pick them up at the shop or we will insure-ship them directly to your feet. Check out the custom shoes and hats gallery to see what we’ve done in the past and get an idea of pricing. And remember, as all Novato shoes are one-of-a-kind, we CANNOT reproduce anything we’ve already done for previous collectors.